Welcome to another Stamp-of-the-Month Blog Hop! If you’ve come from Susan’s blog, you’re on the right track. We’ve got lots of beautiful artwork ready for you to enjoy and be inspired by. 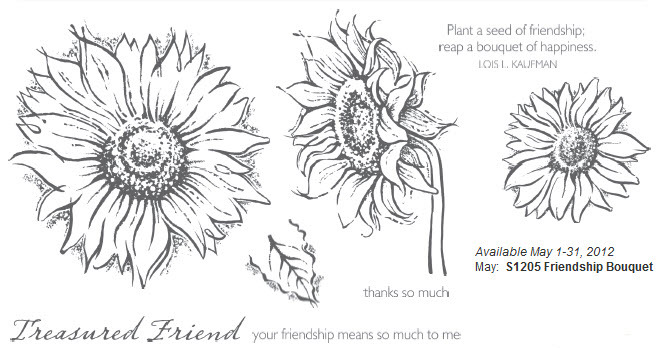 This month’s stamp set is all about sunflowers. This is only the second easel card I’ve made and I think it was perfect for my basket of flowers. If you follow my blog at all, you know I don’t enjoy colouring in stamped images. Well, this time was no different. 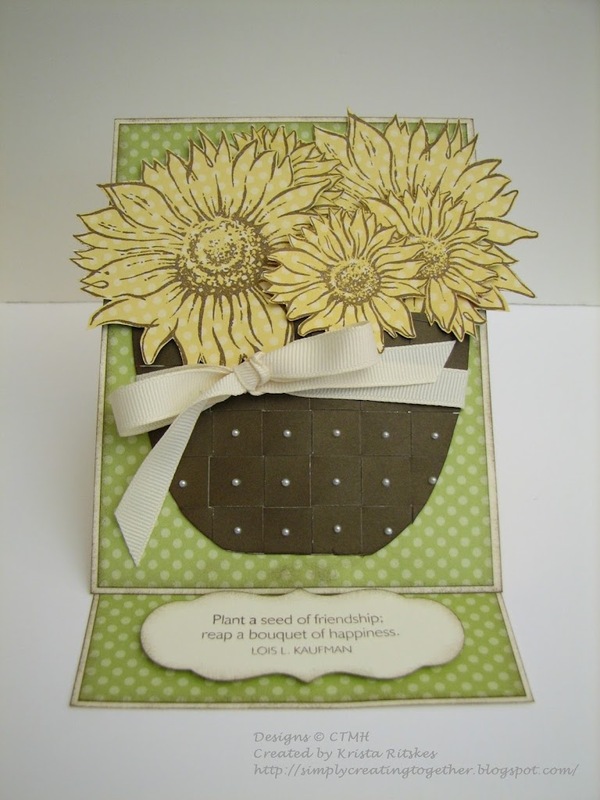 I used the dot sides of the new Dotty for You paper pack to stamp the flowers. They just looked like a basket full, so that’s what I made! The sentiment is stamped on an image I cut from the Cricut long ago that I just didn’t use. And now you get to hop on over to fancyMelissa’s fun blog for some more great artwork. Happy Hopping! I L♥VE this card Krista. Will definitely be scraplifting this one. It’s been pinned. Love the woven basket! Great work. Great job Krista! Love the weaving! LOL. 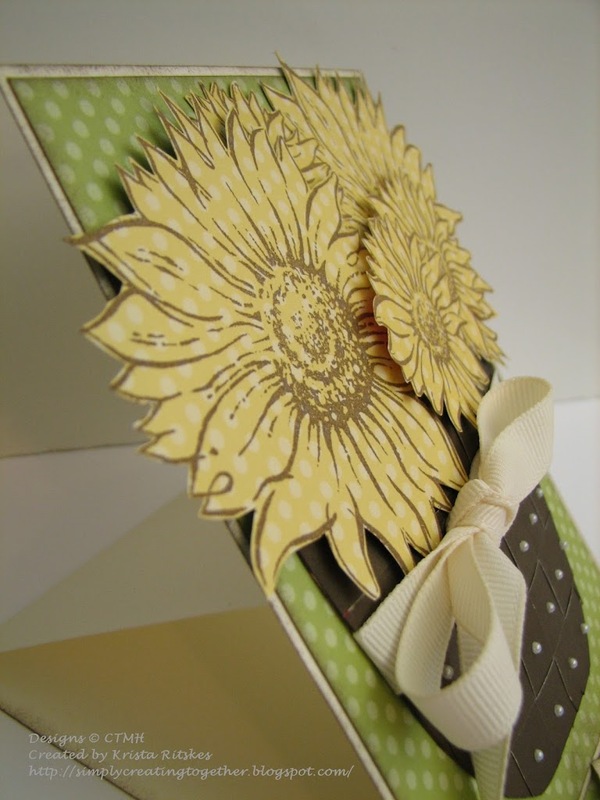 I did the exact same thing with my sunflowers on the yellow dotty paper!!! I think your card looks way better though! I too, L♥VE this easel card! What a great idea – a basket of sunflowers! Great job on the paper weaving! Beautiful work! For not being a fan, you sure did make a spectacular card! The paper weaving is amazing! Gorgeous card! !